***Images from the closing night red carpet and awards ceremony are available upon request. For more information, please visit www.iaac.us. About the Indo-American Arts Council: The Indo-American Arts Council is a registered not-for-profit arts organization passionately dedicated to showcasing, building awareness, and celebrating artists of Indian origin in the performing, visual and literary arts. Annual festivals of art, dance, play writing and film are scheduled through the year, with several special events and book launches. For further information please visit www.iaac.us. NYIFF was born in the aftermath of 9/11 in response to Mayor Giuliani's call to New Yorkers to help rebuild a limping city. The First Annual film Festival opened its doors with Film Diaspora Godfather Ismail Merchant and closed with New York's favorite Indian filmmaker Mira Nair. (New York, NY—May 21, 2012) The 12th Annual New York Indian Film Festival (NYIFF), presented by the Indo-American Arts Council (IAAC), is just TWO DAYS AWAY. Scheduled from May 23 to 27 at the Tribeca Cinemas in Lower Manhattan, NYIFF features more than 50 features, documentaries, and short films over a span of five days and attracts some of the most high profile celebrities, media, and guests. The festival will kick off with an opening night red carpet screening of Bedabrata Pain's CHITTAGONG on May 23 at the Paris Theater, followed by a VIP gala dinner at the Essex House Ballroom. The centerpiece film is Rituparno Ghosh's CHITRANGADA, which will have its world premiere at Tribeca Cinemas on May 25. Finally, Anurag Kashyap's GANGS OF WASSEYPUR will close the festival on May 27 at NYU's Skirball Theater, followed by an awards ceremony and closing night party, sponsored by Wells Fargo. "And the nominees for the 12th annual NYIFF are…"
The independent jury who votes for their favorite nominees in each category are: Parag Amladi, Ashish Avikunthak, Dev Benegal, Jerry Carlson, Tejaswini Ganti, Udayan Gupta, Poorna Jagannathan, Kavey Kaul, Joseph Mathew, Myrna Moncayo-Iyengar, Claus Mueller, Muriel (Mike) Peters, Zenobia Shroff, and Nilita Vachani. The awards are audited by KPMG, and the winners will be announced at an awards ceremony following the closing night film on May 27. ***Media is invited to attend a special press conference at 6 p.m. on Tuesday, May 22, at Misha Nicole Boutique (303 Bowery in Soho), where filmmakers and actors will be available for one-on-one interviews. Interviews will also be granted on the opening and closing night red carpets. To RSVP, please email Jitin@Jingomedia.com. For more information about the entire schedule, please visit http://www.iaac.us/NYIFF2012/. .
(New York, NY—May 1, 2012) Tickets are selling out fast to the plethora of award-winning, controversial, and ground-breaking movies that are part of the stellar line-up of the 12th annual New York Indian Film Festival (NYIFF), the longest-running and most prestigious showcase of Indian films in the United States. Presented by the Indo-American Arts Council, NYIFF 2012 will take place from May 23 to 27 at the home for independent film, Tribeca Cinemas in Lower Manhattan. The opening night red carpet screening of Bedabrata Pain’s CHITTAGONG will take place at the iconic Paris Theater (4 W. 58th St. at 5th Avenue) on May 23, followed by a benefit gala. The centerpiece film, right off the cutting room floor, is the world premiere of Rituparno Ghosh’s CHITRANGADA, which will have two screenings at Tribeca Cinemas. The closing night red carpet screening of Anurag Kashyap’s GANGS OF WASSEYPUR will be presented at NYU’s Skirball Center for the Performing Arts (566 Laguardia Place), followed by an awards ceremony and after party sponsored by Wells Fargo. GANGS OF WASSEYPUR comes directly to us from the prestigious Festival de Cannes 2012, as a part of the Director's Fortnight section. Synopsis: Towards the end of colonial India, Shahid Khan loots the British trains, impersonating the legendary Sultana Daku. Now outcast, Shahid becomes a worker at Ramadhir Singh's colliery, only to spur a revenge battle that passes on to generations. At the turn of the decade, Shahid's son, the philandering Sardar Khan vows to get his father's honor back, becoming the most feared man of Wasseypur. In contemporary times, the weed addicted grandson, Faizal Khan, wakes up to this vengeance that his family has inherited. Staying true to its real life influences, the film explores this revenge saga through the socio-political dynamic in erstwhile Bihar (North India), in the coal and scrap trade mafia of Wasseypur, through the imprudence of a place obsessed with mainstream 'Bollywood' cinema. In CHITRANGADA, Rituparno Ghosh faces the camera again in the role of a choreographer who plans to stage the dance drama Chitrangada on the occasion of Rabindranath's 150th birth anniversary. Rituparno Ghosh is Rudra Chatterjee in this Bengali movie Chitrangada and the character’s nick name is Khokon. Rudra Chatterjee was interested in art from his childhood but he studied Engineering as his father wanted him to study in technical stream. There was a conflict between the father and son, ultimately the son, Rudra became a choreographer. This is the point where the story of the new Bengali film Chitrangada coincides with Rabindranath Tagore's Chitrangada. In Tagore's Chitrangada, the King of Manipur wants to see his daughter Chitrangada as prince of Manipur since he doesn't have a son but Chitrangada wants to remain a girl. Shyam Benegal's retrospective trilogy: ZUBEIDA, MAMMO, SARDARI BEGUM. For the complete line-up of films, ticket information, and synopses, please visit www.iaac.us. About the Indo-American Arts Council: The Indo-American Arts Council is a registered not-for-profit arts organization passionately dedicated to showcasing, building awareness, and celebrating artists of Indian origin in the performing, visual and literary arts. Annual festivals of art, dance, play writing and film are scheduled through the year, with several special events and book launches. For further information please visit www.iaac.us. NYIFF was born in the aftermath of 9/11 in response to Mayor Giuliani’s call to New Yorkers to help rebuild a limping city. The First Annual film Festival opened its doors with Film Diaspora Godfather Ismail Merchant and closed with New York’s favorite Indian filmmaker Mira Nair. (New York, NY—April 17, 2012) Get your tickets now! NYIFF, the longest-running, most prestigious Indian film festival in the country, announces its 2012 line-up of films, including the opening night film, centerpiece film, and sidebar festival. Opening Night Film – Bedabrata Pain’s CHITTAGONG: Set in the turbulence of the 1930s British India, Chittagong is a true story of a 14-year-old boy, Jhunku, and of his journey to find where he belongs. For the first time in Indian history, the British army is defeated by a ragtag army of schoolboys and their teacher, Masterda. Called a traitor by his peers, and let down by a man he trusts, Jhunku impulsively joins the movement. As his world is turned upside down, Jhunku is forced to confront his self-doubts. As the leaders of the movement are progressively caught or killed, Jhunku battles against seemingly insurmountable odds to win a victory of his own. The film is a brilliant, poignant action-drama, made more so by the fact that it is true. Cast: Manoj Bajpai, Barry John and Delzad Hiwale. Centerpiece Film – Tribute to the Late Great Dev Anand through HUM DONO RANGEEN: Hum Dono Rangeen was restored and colorized using Legend Film's proprietary colorization process. The process has consistently been lauded as the highest quality color conversion technology in the world and has been used extensively on Hollywood feature films over the past 10 years. Hum Dono Rangeen was one of the latest colorization projects using the technology and it is considered light years ahead of Mugal e Azam in the quality of its color, artistry and overall design. The colorization of Hum Dono Rangeen was executed by Jagan Mohan at Goldstone Technologies, a technology licensee of Legend Films under the collaborative eye of Legend Films engineers and technicians. It lives as the finest example of Bollywood colorization that exists today. Sidebar Festival – Shyam Benegal Retrospective followed by a post-screening discussion with director: Mamoo (1994), Sardari Begum (1996), and Zubeidaa (2001) - the first such programming of Benegal's trilogy based on scripts by renowned critic, journalist, and filmmaker Khalid Mohamed. All three films are Mohamed's personal stories about his mother, grandmother, aunt, and grandaunt. Shyam Benegal (born 14 December 1934, Hyderabad) is a prolific Indian director and screenwriter. With his first four feature films, Ankur (1973), Nishant (1975), Manthan (1976) and Bhumika (1977), he created a new genre, which has now come to be called the "middle cinema" in India. He has expressed dislike of the term, preferring his work to be called New or Alternate cinema. He was awarded the Padma Shri in 1976 and the Padma Bhushan in 1991. On 8 August 2007, Benegal was awarded the highest award in Indian cinema for lifetime achievement, the Dadasaheb Phalke Award for the year 2005. He has won the National Film Award for Best Feature Film in Hindi seven times. (New York, NY—March 25, 2012) New York State Governor’s Office for Motion Picture and Television Development honored Indian actor and activist Shabana Azmi with a proclamation Friday night for her commitment to the arts and contributions to New York City’s film industry. Hosted by the Indo-American Arts Council, the event kicked off the 12th annual New York Indian Film Festival (NYIFF), which will be held from May 23 to 27 at Tribeca Cinemas in Manhattan. Azmi, who is an advisory board member of the festival, said "we have proven ourselves as a legitimate and successful festival year after year, and the fact that we are still struggling to find sustained funding is surprising." "Shabana Azmi's talent has garnered international acclaim, helping to shape the Indian film industry and build awareness of Indian cinema in North America," said New York State Governor's Office for Motion Picture and Television Development Executive Director Pat Kaufman. "We applaud the NYIFF for honoring Azmi's achievements, both on and off screen, and are pleased to celebrate her success, especially as we prepare to host the Indo-American Arts Council's 12th Annual New York Indian Film Festival in lower Manhattan this spring." "Shabana has been a friend and Advisory Board member of the IAAC since its inception, using her talent, activism, and energy to help NYIFF stay the course of true, Independent and Diaspora cinema,” said Indo-American Arts Council Founder and Executive Director Aroon Shivdasani. "We are thrilled to toast her Padma Bhushan from India and applaud her Proclamation from the State of New York!" (New York, NY): The Indo-American Arts Council presents the 12th Annual New York Indian Film Festival in May. At a private ceremony at the Law Offices of Proskauer on the 23rd of March 2012, Council Member Elizabeth Crowley will recognize NYIFF’s Advisory Board member,Activist & Actress Shabana Azmi’s significant contributions to Indian cinema. Other esteemed guests include Patricia Kaufman, Executive Director of the New York State Governor’s Office for Motion Picture and Television Development. What: Indo American Arts Council's 12th Annual New York Indian Film Festival will host a private reception at the Law offices of Proskauer, to congratulate and recognize the significant accomplishments of their Advisory Board Member Shabana Azmi. 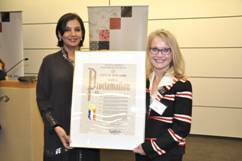 Who: City Council Member Elizabeth Crowley presents Proclamation to acclaimed Indian actress, Shabana Azmi. Other VIP Guests include Patricia Kaufman, Executive Director Patricia Kaufman of the New York State Governor’s Office for Motion Picture and Television Development. IAAC: The Indo-American Arts Council is a registered 501(c)3 not-for-profit, secular service and resource arts organization charged with the mission of promoting and building the awareness, creation, production, exhibition, publication and performance of Indian and cross-cultural art forms in North America. The IAAC supports all artistic disciplines in the classical, fusion, folk and innovative forms influenced by the arts of India. We work cooperatively with colleagues around the United States to broaden our collective audiences and to create a network for shared information, resources and funding. NYIFF: The 12th Annual New York Indian Film Festival is North America's oldest and most prestigious destination for feature films, documentaries, and shorts from and about the Indian subcontinent. NYIFF is a once-a-year opportunity to experience the rich and diverse film cultures of the Indian subcontinent through a mix of film screenings, discussions, industry panels, nightly parties, an awards ceremony, and gala red carpet events. NYIFF has premiered Slumdog Millionaire, The Namesake, Monsoon Wedding, Water, Bride & Prejudice, Ye Sali Zindagi, Gulaal, Well done Abba, Raavana, Iti Mrinalini, .. The Indo-American Arts Council, which sponsors the 12th Annual New York Indian Film Festival (NYIFF), is hosting a private reception to congratulate and recognize the significant accomplishments of their Advisory Board Member Shabana Azmi. New York State Governor’s Office for Motion Picture and Television Development Executive Director Pat Kaufman will be congratulating Shabana Azmi and NYIFF for their contributions. Friday, March 23rd, 7 – 9 p.m.
May 26th - Sidebar: Shyam Benegal Retrospective followed by post-screening discussion with director. Mamoo (1994), Sardari Begum (1996), and Zubeidaa (2001) - the first such programming of Benegal's trilogy based on scripts by enowned critic, journalist, and filmmaker Khalid Mohamed. All three films are Mohamed's personal stories about his mother, grandmother, aunt, and grandaunt. The Longest-Running and Most Prestigious Indian Film Festival in the U.S.
(New York, NY—February 6, 2012) Filmmakers and producers have until February 15, 2012, to submit shorts, documentaries, or feature films pertaining to the Indian subcontinent for the 12th Annual New York Indian Film Festival (NYIFF), presented by the Indo-American Arts Council (IAAC). Scheduled from May 23 to 27 at the eclectic Tribeca Cinemas in Lower Manhattan, NYIFF features more than 30 films over a span of five days and attracts some of the most high profile celebrities, media, and guests. The festival will commence with an opening night film screening on May 23 at the Paris Theater, followed by a VIP gala dinner at the Essex House Ballroom, attracting more than 500 of New York City’s crème de la crème cinephiles. In the past 11 years, NYIFF (formerly known as the IAAC and MIAAC Film Festivals) has premiered some of the most well-known South Asian and foreign films, including Slumdog Millionaire, Bride and Prejudice, Monsoon Wedding, The Namesake, and several others. For more information about submissions and the 2012 New York Indian Film Festival, please visit http://www.iaac.us/NYIFF2012/.